Asian handicap is a form of betting where the draw result is eliminated. In the standard 1X2 wagering, the possibilities of each outcome is 33%. In Asian handicap you have two betting options, betting on home or away, so you have a 50% chance of success. Actually, Asian handicap betting offers the underdog of the game with an early lead before the kick off. However, in football, one goal can change everything in your favor, or the opposite side. Let us make you understand with the explanations of the rules below. 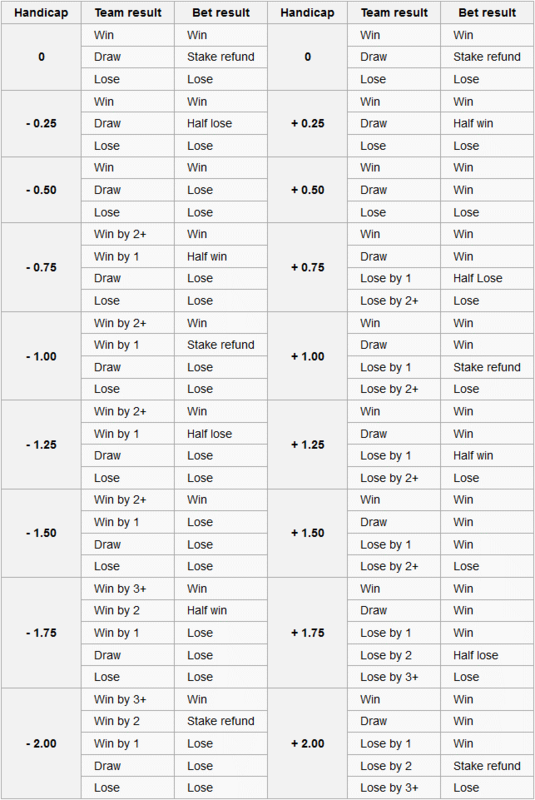 There are lots of Asian handicap lines and you will read most of them through this page. Please ask your questions in the comments if you do not understand any points or rules. For the rest of the guide, we will use AH for abbreviation. Here the game starts 0-0. No advance is given to any team. Draw option is eliminated and the rules are simple. * You bet 100$ on Chelsea to win 0:0 AH at 1.90 odds. To win your coupon, you need Chelsea to win the game, simply to win. If Chelsea wins, you win 100$ X 1.90 = 190$. Your profit is 190$ – 100 = 90$. If a possible draw occurs, you get your stake (100$) back. No wager, no bet. If Chelsea loses the game, you lose your bet too. * It is the same with Liverpool 0:0 AH. You need Liverpool to win the game, and if a draw occurs, you get your money back. No Wager, no bet. If Liverpool loses, you lose your bet too. You may see some bookies offer something like DNB, Draw no bet, or Level ball. It is the same with 0:0 AH and in most cases used in football bets. Here the game starts 0-1/4. The underdog team is advanced with a quarter goal before the kick off. Draw option is eliminated. It is more complicated from half AH. You win, win half, lose or lose half stake of your bet. Lets examine it by the example below. * You bet 100$ on Monaco to win -1/4 AH. To win your coupon, you need Monaco to win the game. If Monaco wins, you win 100$ X 2.00 = 200$. It means you make 200$ – 100$ = 100$ profit. If a draw occurs, you lose half of your stake (50$) and the other half (50$) is back. If Lyon wins the game, you lose your all stake. * You bet 100$ on Lyon to win +1/4 AH. To win your coupon, you need Lyon to win the game. If Lyon wins the game, you win 100$ X 1.90 = 190$. It means you make 190$ – 100$ = 90$ profit. If a draw occurs, you get half of your stake (50$) back and win the other half (50$) at 1.90. It means, you win 50$ (back) + 95$ (50$ X 1.90) = 145$. Your profit is 145$ – 100$ = 45$. Here the game starts 0-1/2. The underdog team is advanced with a half goal before the kick off. Draw option is eliminated. In addition, there is no money back in any case. You will win or lose your money. * You bet 100$ on Porto to win -1/2 AH (we use minus (-) if the team is favored by AH). To win your coupon, you need Porto to win. In any other cases, you lose your money. If Porto wins, you win 100$ X 1.85 = 185$. It means you make 185$ – 100$ = 85$ profit. If Benfica wins or the game ends tie, you lose your money. * You bet 100$ on Benfica to win +1/2 AH (we use plus (+) if the team is advanced by AH). To win your coupon, you need Benfica to win or tie the game at the end of 90 minute-time. If one of these occurs, you win 100$ X 2.00 = 200$. It means you make 200$ – 100$ = 100$ profit. If Porto wins the game, you lose your money. Porto wins and Porto -1/2 AH is the same things in Asian handicap betting. Here the game starts 0-3/4. The underdog team is advanced with a quarter goal before the kick off. Draw option is eliminated. It is different from 1/4 AH by a slight exception. * You bet 100$ on Betis to win +3/4 AH. (Here the home team is underdog; as a result of it, Betis is advanced by the AH). To win your coupon, you need Betis to win or tie the game. If Betis wins or ties the game, you win 100$ X 1.90 = 190$. Your profit is 190$ – 100$ = 90$. Consider that the game ends by Real Madrid win by 1 (0-1, 1-2, 2-3). Thus, you lose your half stake (50$) and the other half (50$) returns. If Real Madrid wins the game by 2 or more goals (0-2, 1-3, 0-3), you lose your all stake. * You bet 100$ on Real Madrid to win -3/4 AH. To win your coupon, you need Real Madrid to win by 2 or more goals (0-2, 0-3, 1-3). If Real Madrid wins the game by 2 or more goals, you win 100$ X 1.90 = 190$. Your profit is 190$ – 100$ = 90$. If Real Madrid wins by 1 goal (0-1, 1-2, 2-3), you get your half stake (50$) and win the other half (50$ X 1.90). You win 50$ (back) + 95 (50$ X 1.90) = 145$. Your profit is 145$ – 100$ = 45$. If the game ends tied or Betis wins, you lose your all stake. Here the game starts 0-1. One goal advance is given to underdog team. Draw option is eliminated again. * You bet 100$ on Juventus to win -1 AH. To win your coupon, you need Juventus to win by 2 or more goals (2-0, 3-0, 3-1). If Juventus wins by 2 or more goals, you win 100$ X 1.80 = 180$. You profit is 180$ – 100$ = 80$. If Juventus wins by 1 goal (1-0, 2-1, 3-2..), you get your money back. No wager. If the game ties or Bologna wins, you lose all your stake. * You bet 100$ on Bologna to win +1 AH. To win your coupon, you need Bologna to win, or a draw. If the game ends drawn or Bologna wins, you win 100$ X 2.05 = 205$. Your profit is 205$-100$ = 105$. If Bologna lose by 1 (1-0, 2-1, 3-2), you get your money back. No Wager. However, any Juventus win by 2 or more, make you lose your bet. This is not something special that will make you wonder. It is just how the bookies are listing the options to their software. For example. Bet365, is offering the standard AH option, depending on the odds of the game, and they have all other AH options listed under a different section called ‘Alternative AH’. Example : Huddersfield vs Wigan. The main AH option is -0.5 @1.85 for Huddersfield, +0.5 @2.05 for Wigan. This is listed normally under their AH section as the main AH offer. All other AH options like -0.75, -1, -1.25, -1.5 etc, are listed under ‘Alternative AH’ section. Personally, we prefer Asian handicap betting in football, instead of standard betting, due to more winning possibilities. The rules may look difficult with the first point of view, but in the end you will find it so easy. Best of luck!